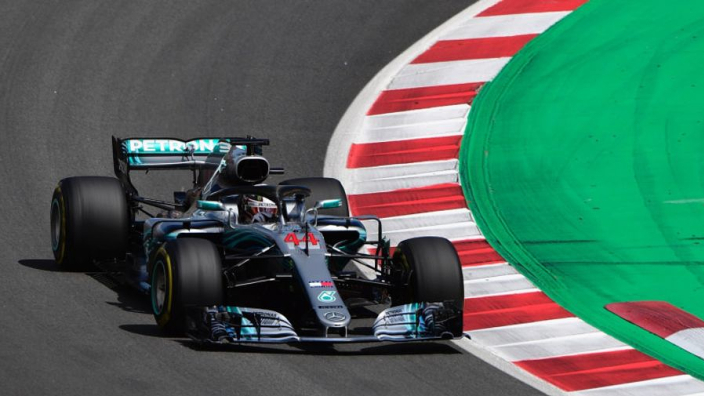 Lewis Hamilton took an utterly dominant Spanish Grand Prix victory as Mercedes' sluggish 2018 was blown away by a somewhat vintage one-two finish in Barcelona. Valtteri Bottas followed Hamilton home in second with Sebastian Vettel completing the podium, although Ferrari's gamble under the Virtual Safety Car perhaps cost him second. After being gifted victory in Baku last time out, Hamilton was in far from celebratory mood, but his 64th grand prix victory was much sweeter, a superb drive from pole position. After being robbed of victory by a puncture in Baku, Bottas managed his tyres smartly to take second place, with Max Verstappen completing the podium after holding off Vettel in the closing stages. Vettel had put himself in between the Mercedes cars off the line in a start which saw a sliding Romain Grosjean wipe out Nico Hulkenberg and Pierre Gasly. But Hamilton was in a league of his own and never looked like giving up victory, prompting Ferrari into a gamble under a Virtual Safety Car brought on by Esteban Ocon's second retirement in succession. Pitting from second for fresh tyres, Vettel was caught in pit-lane traffic and emerged in fourth, behind the Red Bull of Verstappen. Although Verstappen damaged his front wing in another clumsy moment under the VSC with Lance Stroll, the lack of overtaking opportunities at the Circuit de Catalunya cost Vettel dearly and he now trails Hamilton by 17 points in the standings. It compounded a frustrating outing for Ferrari as they lost top spot in the constructors' standings to Mercedes and also saw Kimi Raikkonen retire after suffering engine troubles for the second time in the weekend. If the parts that failed in practice are unsalvageable and the damage from the race is severe, the Finn could be on the brink of grid penalties after just five races in 2018. Both Mercedes and Hamilton have said the champion's new contract is ready to be signed. After such an impressive performance - at a track that often hints at the strongest car on the grid - the time could finally be right! Ferrari not only coughed up vital points for Vettel, but if Raikkonen is now set for a season filled with engine penalties, the German will also lose vital assistance in races as he challenges Hamilton for the title. Grosjean was unfortunate to spin out so dismally, given he was attempting to avoid contact with team-mate Kevin Magnussen. The Haas is definitely the best of the rest, despite McLaren's raft of updates and Renault's works-team budget. Magnussen has been controversial this year, but he drove one of his calmest races to bank more big points. It remains to be seen if it will move on to Monaco, but Mercedes have looked like their old selves all weekend and Ferrari must sharpen up if we are to avoid another few months of Silver Arrow success.